Seniors Kenzi Crawford (left), and Kara Morgan (right) are two mainstays for the talented Coal Ridge Titans volleyball team. The two seniors are league leaders in a number of offensive categories, and will get back on the court Saturday in 3A Region 4 tournament at Platte Valley. Coal Ridge seniors Kara Morgan and Kenzi Crawford have taken different routes to their current leadership roles on the Titans volleyball team under head coach Aimee Gerber, but those routes have helped shape them into not only strong players but strong leaders as well, carrying the Titans into Saturday’s 3A Region 4 volleyball tournament where the No. 21 Titans will take on No. 4 Platte Valley and No. 33 DSST: Stapleton. Morgan will become the first four-year varsity letter winner for Gerber at the end of the season, but her junior year was interrupted with a knee injury that kept her off the court for a majority of the season. Prior to her junior year, Morgan was blossoming into a star in the valley as an outside hitter for the Titans, but to hear the senior captain talk about that year away, it did much more good for her game than bad, leading to a dominant season for the blue and black. Prior to that knee injury, Morgan played just two sets before her season was cut short. Coming into last season, the powerful outside hitter was expected to step right in for Nicole Mooney, but after being lost for the season, Morgan had to adjust her line of thinking from the bench. That season on the sideline allowed her to learn more than she ever would have on the court. “It was tough to sit there; I was really upset about it,” Morgan said. “But that time away forced me to watch volleyball from a different perspective and learn the game in a different way. I got better at reading shoulders and seeing how big of a role that plays in the game, so now this year it’s changed a lot of how I play defense, block at the net, and all of that. Morgan led the 3A Western Slope League in kills with 266, finishing 29 kills ahead of the next closest player in the league. Along with her dominance at the net offensively, Morgan developed into one of the top defenders for the Titans, finishing second in the league in digs with 262. That’s a testament to the work Morgan has put in over the years, transforming herself from a promising freshman into a physically dominant senior on the court. 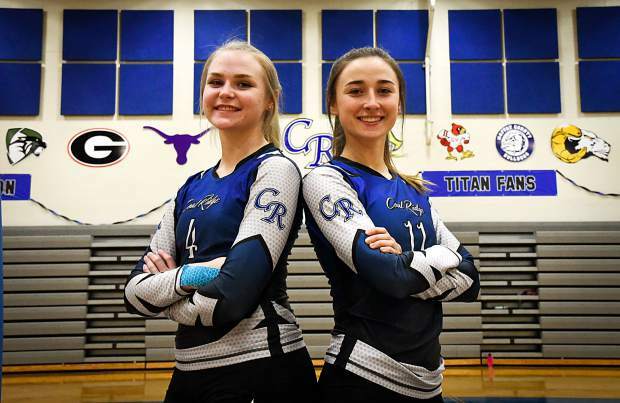 Crawford took the more traditional route to a starting role for the Titans last season, biding her time behind standout setter Dana Kotz the past few years before cracking the starting lineup her junior season. Dating back to last year, Crawford has been one of the top setters in the state of Colorado in 3A, recording an impressive 1,284 assists in 153 sets played. That averages out to 8.4 assists per set, or roughly 33 percent of the possible points in a winning set. Coming into the 2018 season, Crawford was named one of Colorado Prep’s top 10 setters in 3A. She’s more than lived up to that high praise, helping the Titans win a second straight 3A Western Slope League championship with an undefeated league record. Crawford and Morgan are close friends off the court, which has helped the two develop a close bond on the court, making for a difficult duo to play against. Aside from spreading the ball around, Crawford developed into a strong net-front presence, as well as one of the top servers in the state for the Titans, giving Coal Ridge that much more firepower to work with. After a league championship and a fourth-place finish in its home tournament last weekend, the Titans hit the road Saturday morning for the regional tournament against Platte Valley and DSST: Stapleton with a state tournament bid on the line.